There are more than 10,000 trees on NC State’s Raleigh campus. 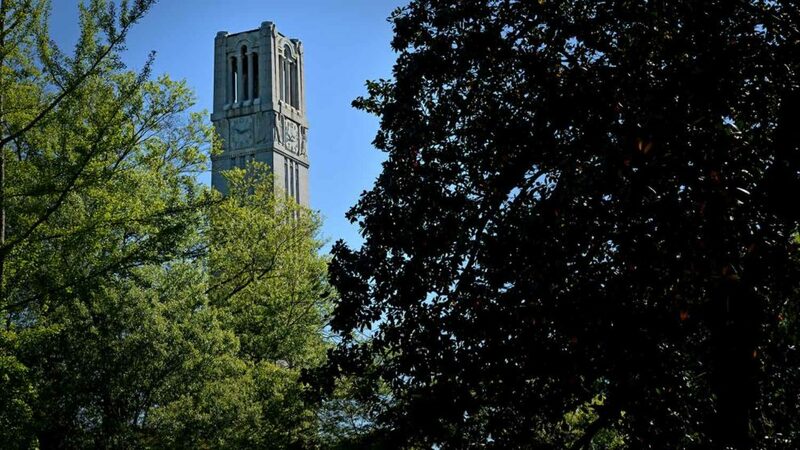 Tree Campus USA certification recognizes NC State for its efforts to promote healthy campus trees while also engaging campus in conservation efforts. NC State University has earned recognition as a 2018 Tree Campus USA from The Arbor Day Foundation. The designation honors U.S. colleges and universities that promote healthy campus trees and engage the campus community in conservation. This is the first time NC State has applied for and earned this distinction. Tree Campus USA encourages healthy community forests by requiring colleges and universities to meet five core standards: creation of a tree advisory committee and a campus tree care plan, having an annual budget for campus tree care, hosting an Arbor Day observation and providing conservation-related student service opportunities. NC State has been meeting many of these standards for years. Grounds Services has long had arborists on staff and an active tree management program. Several academic courses use campus trees for service learning projects, and NC State annually participates in local Arbor Day celebrations. In 2019, NC State will broaden the scope of its existing Heritage Tree Committee to encompass urban forest management and the Tree Campus USA certification. WIth this certification, NC State joins more than 350 other U.S. colleges and universities that have committed to preserving and managing healthy campus forests. Published in Land, News, Newswire, Uncategorized.